DJ Baxendale and other players greeted fans at the gates on Fan Appreciation Day Monday. The Lehigh Valley IronPigs scored a pair of 10th inning runs to defeat the Rochester Red Wings 4-2 Monday afternoon at Frontier Field in the season finale of the 2018 season. Rochester took first inning lead for the fourth time in the last five games after Nick Gordon started a two out rally against Lehigh Valley starter Ranger Suarez. After drawing a walk, Gordon scored on a double from Post-season All-Star Kennys Vargas to put the Wings ahead 1-0. Wings starting pitcher Chase De Jong kept the IronPigs scoreless until encountering trouble in the fifth. After hitting Zack Green to open the inning, a double and a sacrifice fly allowed by De Jong brought home Green to tie the game at 1-1. 19-year-old Victor Tademo made his Triple-A debut for the Red Wings and recorded his first career hit in the fifth inning after being recalled from Single-A Cedar Rapids on Sunday. Tademo finished the day going 1-for-4. John Curtiss came on for De Jong in the sixth after the starter worked five innings. He allowed just one run on four hits while walking one and striking out six. De Jong threw 61 pitches, 43 for strikes. Rochester threatened to take the lead back in the sixth after Zander Wiel tripled with one out before Suarez was able to retire Gordon and Jon Kemmer to end the inning. Ryan Eades came on to pitch the seventh. Curtiss went one perfect inning while striking out a pair of IronPigs. The perfect inning was Curtis' third straight appearance without allowing a hit. In his final start of the regular season, Suarez went 6.0 innings for Lehigh Valley allowing just one run on four hits while striking out three. He threw 64 pitches, 48 for strikes. Heading into the ninth still tied at 1-1, Rochester brought in Ryne Harper after Eades went 2.0 innings allowing just two hits while striking out three. In the bottom of the ninth, Vargas blooped a double to left field to put the tying run in scoring position. After an intentional walk to Jon Kemmer, Jordan Pacheco popped out. Jeremy Hazelbaker grounded out to send the game into extra innings. Lehigh Valley went ahead in the 10th inning after a double by Zach Green brought home placed runner Danny Ortiz. The 'Pigs added a pair of insurance runs to take a 4-1 lead. Luke Bard came in to relieve Harper and escape further trouble. Alex Perez drove in a run with a sacrifice fly in the bottom of the 10th inning to make the score 4-2. Messenger Post Media presents THE PICS OF THE DAY. 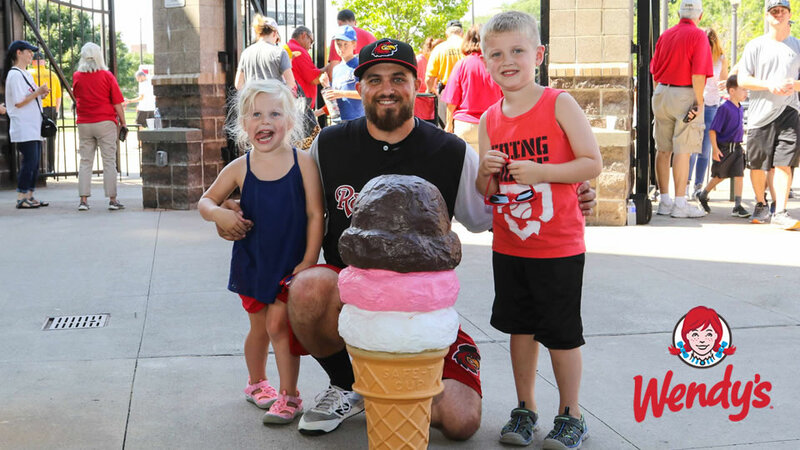 Click here for batting practice shots, pre-game on-field promotions like the Zweigle's Honorary Coach and Toyota Play Ball Kid, Anthem and first pitch, and in-game action shots from our talented staff of photographers. 1990 - Rochester beat Syracuse to set a franchise record with 89 wins in the regular season. The win was the Red Wings eleventh in their final twelve regular season games. 2005 - The Red Wings defeated rival Syracuse 5-1 Saturday in the final home game of the season. 12,251 fans witnessed starting pitcher J.D. Durbin allow just one run over seven innings of work. Josh Rabe's three-run home run in the first was all Durbin needed. Brian Buchanan and Garrett Jones led the second inning off with back-to-back singles before Rabe drilled a three-run homer into the visiting bullpen. The home run gives Rabe 11 for the season in just 88 games played. Buchanan added a two-run blast in the sixth inning, scoring Luis Rodriguez, giving Rochester a 5-1 lead. 2006 - With the 12,251 fans in attendance at Saturday nights final home game, the Wings' season attendance grew to 452,301 for the season (sixth highest in Red Wings history)...Red Barons pitcher Jeremy Cummings pitched a no-hitter, while the Scranton offense pounded out 16 hits in a 5-0 win over the Red Wings Sunday night at Frontier Field. 1926 - Buffalo's William "Big Bill" Kelly crushes his 41st home run of the year to add to his International League record for long balls in a season. He had surpassed the previous high of 34 (Red Wingo, Toronto, 1922) weeks earlier, securing his second IL home run title in three years. Days later Kelly would end the season with 44 homers to go along with his .330 average and 151 RBI, giving him the League's best RBI total for the 3rd straight season. Kelly's playing career ended in 1930, but he remained in baseball for over 20 more years in a variety of positions. In 1954 he was inducted into the IL Hall of Fame, recognized as the only man to play, manage, and umpire in the International League during his career.